President Vladimir Putin on Wednesday dismissed US claims Russia is violating a major Cold War treaty limiting mid-range nuclear arms, as a senior general lashed out at Washington's attempts to "contain" Moscow. The tense rhetoric comes a day after Secretary of State Mike Pompeo said Washington would withdraw from the Intermediate-Range Nuclear Forces treaty (INF) within 60 days if Russia does not dismantle missiles that the US claims breach the deal. 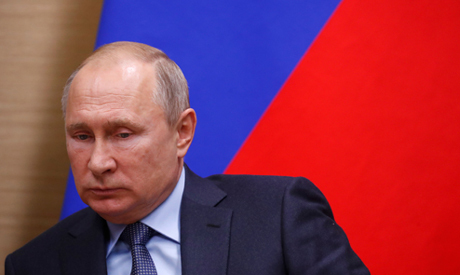 "First the American side stated its intention to withdraw from the treaty... then it began to look for the justifications for doing so," Putin said in comments carried by Russian news agencies. "The primary justification is that we are violating something. At the same time, as usual, no evidence of violations on our part has been provided," he said. The comments echoed earlier statements from the Russian foreign ministry, which dismissed the accusations against Moscow as "groundless". In October, President Donald Trump sparked global concern by declaring the United States would pull out of the deal and build up America's nuclear stockpile "until people come to their senses". But on Monday, the US leader said he wants talks with Putin and his Chinese counterpart Xi Jinping "to head off a major and uncontrollable arms race". Kremlin spokesman Dmitry Peskov said facts had been distorted "in order to camouflage the true goal of the US withdrawing from the treaty". Meanwhile, the Russian Army Chief of Staff Vasily Gerasimov said that Moscow would increase the capabilities of its ground-based strategic nuclear arms. "One of the main destructive factors complicating the international situation is how the US is acting as it attempts to retain its dominant role in the world," he said in comments released by the defence ministry. "It is for these purposes that Washington and its allies are taking comprehensive, concerted measures to contain Russia and discredit its role in international affairs." Signed in 1987 by then US president Ronald Reagan and Mikhail Gorbachev, the last Soviet leader, the INF resolved a crisis over Soviet nuclear-tipped ballistic missiles targeting Western capitals. But it was a bilateral treaty between the US and the then Soviet Union, so it puts no restrictions on other major military actors like China. Pompeo said at a meeting with fellow NATO foreign ministers on Tuesday that there was no reason why the US "should continue to cede this crucial military advantage" to rival powers. NATO said it was now "up to Russia" to save the treaty. The Trump administration has complained of Moscow's deployment of Novator 9M729 missiles, which Washington says fall under the treaty's ban on missiles that can travel distances of between 310 and 3,400 miles (500 and 5,500 kilometres). The nuclear-capable Russian cruise missiles are mobile and hard to detect and can hit cities in Europe with little or no warning, according to NATO, dramatically changing the security calculus on the continent. The State Department said in a statement Tuesday that it had provided Moscow with "more than enough information for Russia to engage substantively on the issue". The information included details on the missile's test history and the names of companies involved in developing and producing the missile and its launcher, the State Department said. US-Russia ties are under deep strain over accusations Moscow meddled in the 2016 US presidential election. The two states are also at odds over Russian support for Bashar al-Assad's regime in Syria's civil war, and the conflict in Ukraine.